Min of two active text ads/banners per adgroup running at all times. Once one is proven to be much more effective than the others you must rewrite the less effective ad. Collecting a min statistical sample of 4 conversions per ad in order to evaluate the true Cost Per Acquisition of a particular ad. Rewrite the the ad with the higher CPA. Once you rewrite a ad it looses its statistical history. Notice! the first ad achieved a higher CTR had a lower Avg CPC since its quality score was better due to its high CTR, BUT its conversion rate was much lower than the second ad that achieved a much lower CTR and as a result had a much higher Avg CPC; Yet it still got the lower CPA! 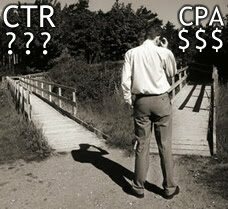 The bottom line is CPA! YOU must understand track & calculate it at all times.